Definitions in finance and is alternative beta cheap alpha? There is significant disagreement in finance on the very definition of terms more so than in other sciences. This is different than saying there is disagreement on theories to explain some phenomena. This is also more fundamental than the finance problem that many theories prove not to be true empirically and thus cause disagreement through anomalies. This disagreement on definitions is one reason why finance will not or should not be considered physics. For example, what is the definition of alpha? If there is not agreement on the market portfolio or the benchmark, then it is not easy to measure or define alpha. I focus on alpha definition because it should be so simple to define and is fundamental to making good investment decisions. Alpha is excess return not associated with systematic risk. Managers who have skill will generate alpha or returns above systematic risk. Investor should seek and pay for skill managers who generate alpha. To find alpha, investors need to define beta since alpha is only measured after accounting for beta. Yet, if you ask for a manager's beta, there is no single measure or definition. There has to be agreement on the timeframe for measurement, the sample period, the benchmark or a set of benchmarks to be used, and on looking at a market portfolio or a set of risk premia. If you went to three analysts and asked them to measure the alpha of a hedge fund manager, my guess is that you will get at least five different measures. A way out of this problem is to switch from trying to measure the elusive alpha to measuring different forms of risk premia which may be better defined. 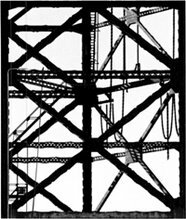 Alternative risk premia and their betas focus on the core issue of measuring specific risk and the excess return for taking on those risks. 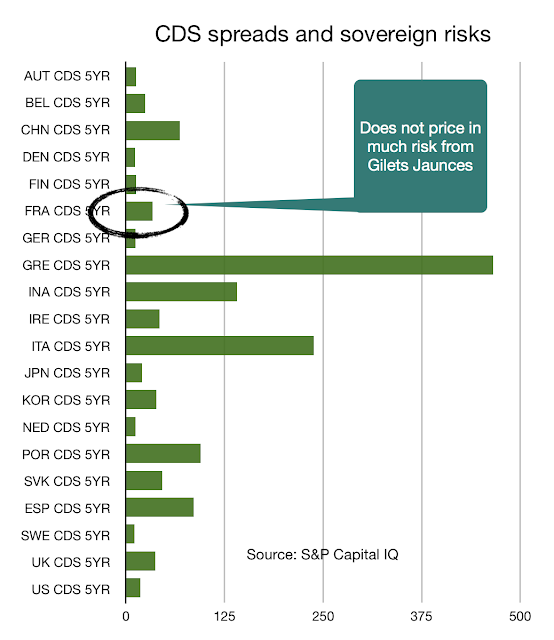 This is not so much buying skill, but rather isolating risk premia for which investors should receive a return. Measuring risk premia changes the investment game from looking for skill to looking for risks taken. Since many hedge fund managers generate return through taking on specific risk premia as well as trying to generate alpha and show skill, perhaps it is better to find the alternative beta they are generating and determining whether that is what you want to hold. 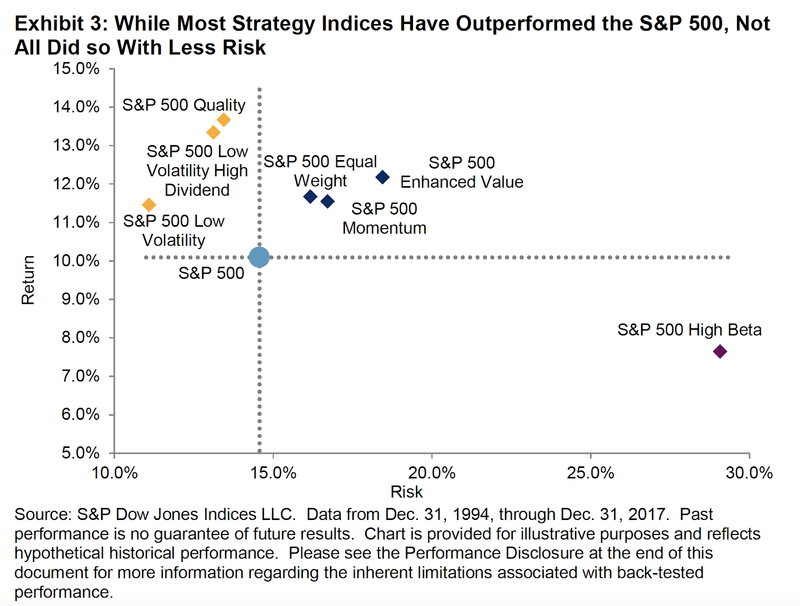 If risk premia can be isolated more easily than skill it can serve as a substitute measure for what is desired, uncorrelated returns to market betas. Buy different risk premia and not look for skill. These risk premia should be obtained more cheaply than alpha and the pricing can be more transparent. Buying portfolios of alternative beta may be a form of cheap alpha. Most of finance focuses on measurable risk. Less focus is uncertainty or events that cannot be give an objective probability of occurring. Those events that are hard to measure provide the greatest opportunity. 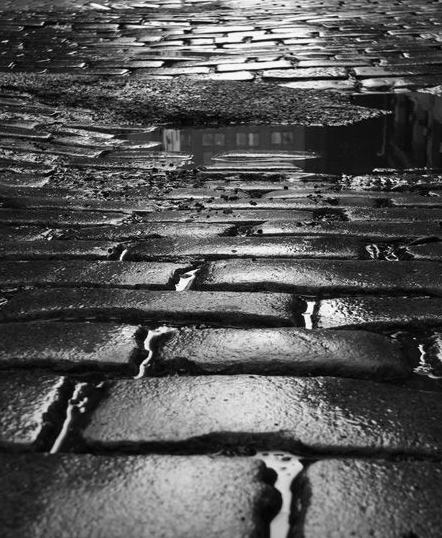 Even less time is spent on ambiguity which is not the same as uncertainty. An ambiguous decision situation may have more than one meaning or interpretation. Ambiguous events may have known probabilities but the decision-maker may have missing information. The model or analysis for these situations have doubt or cannot be fully measured. A Fed announcement may be ambiguous because it may have more than one meaning. This is different from an uncertain situation where the likelihoods are unknown. A recession model may be ambiguous because it does not have all the information necessary to make a judgment or similar models will provide different results. An investment skeptic should look closely for ambiguity. 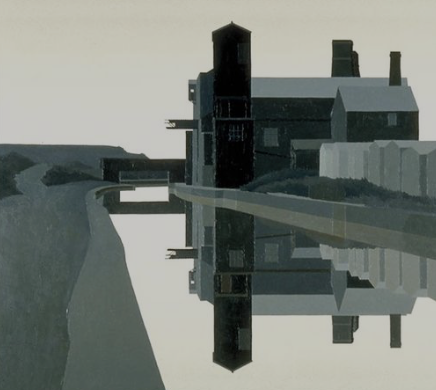 Can there be more than one set of beliefs provide a rational narrative of a future event? If yes, then an investor should be skeptical of the story being told. Statements that are hard to interpret or verify with data should be looked at with a high degree of skepticism. For example, commentators who use ambiguous language should be viewed with a high degree of skepticism. We have talked before about the imprecision of language with respect to investment advice. 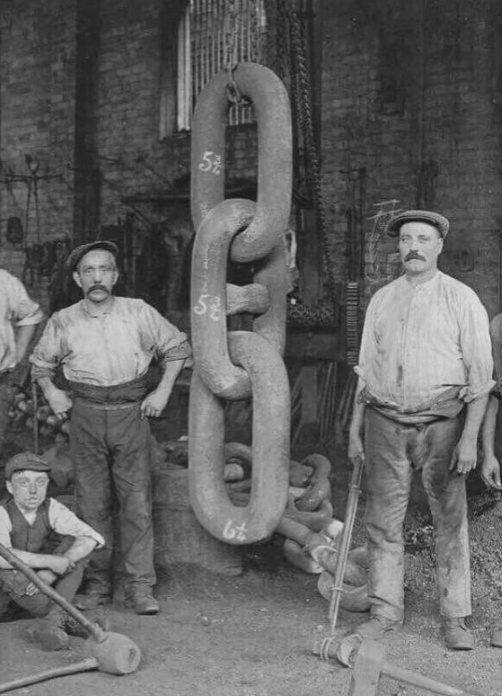 If comments cannot be supported with data, don't place a lot of weight on the statements. Decision-making does not have to be focused on a yes or no conclusion. The skeptic can have a third choice - "I don't know". He will pass on a decision. Some may view that passing on a decision is a higher level of risk aversion, but we take a more practical view. The skeptic will form a decision feedback loop; not enough information, pass on a decision and go back and collect more information. Skepticism is good for investment work. There is growing competition with how investors access returns for different investment strategies. For example, hedge funds have developed multi-strategy approaches to investing. The multi-strategy approach has replaced fund of funds as a good means for accessing diversified hedge fund return exposures. On the other hand, there are the bundled offerings of alternative risk premia through banks who are now effectively competing in the multi-strategy hedge fund space. Money managers and banks have responded to the changing view of how returns are generated and decomposed in markets. 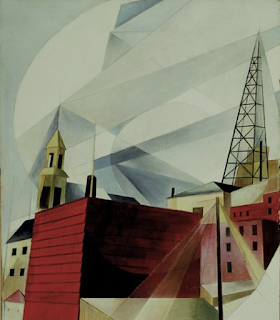 The philosophical focus has shifted from asset class or simple alpha and market beta descriptions to more sophisticated decompositions of returns like factor or risk premia. The premise is that quantitative analysis can decompose risks more effectively than a simple classification based on asset classes. The deeper decomposition of risk will lead to better understanding and management of the return generation process. The developments in alternative risk premia (ARP) swap products from banks are their attempt to better compete in the quantitative management space and provide alternatives to multi-strategy funds. ARP products combine quantitative skill, indexing, passive investing, and risk premia work. We think that bank swap competition will result in even further pressure on asset and hedge fund managers. The process of creative destruction will continue. 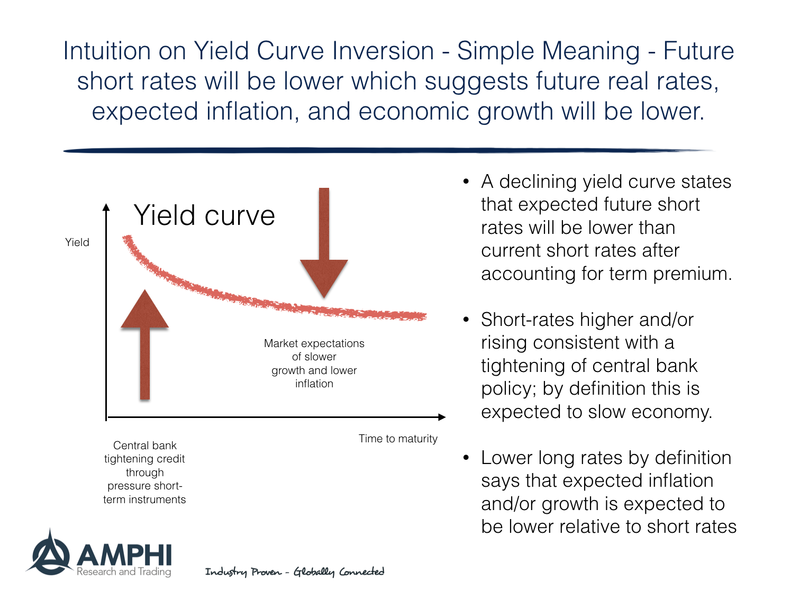 Everything you have heard about yield curve inversion is true; nevertheless, everything that is true may not harm your investments. 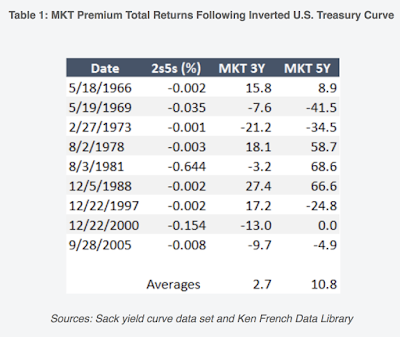 Yield curve inversion is a good predictor of recession, and there is a link between this inversion, recession prediction, and equity declines. However, being the first to react to flattening or inversion may not win you portfolio success. The important question is determining what the inversion signal represents between current and longer-term expectations. In simple terms, short rates tell us something about current Fed policy, current expected inflation and current economic growth. Longer rates tell us something about Fed policy, expected inflation, and current economic growth, but over longer horizons. 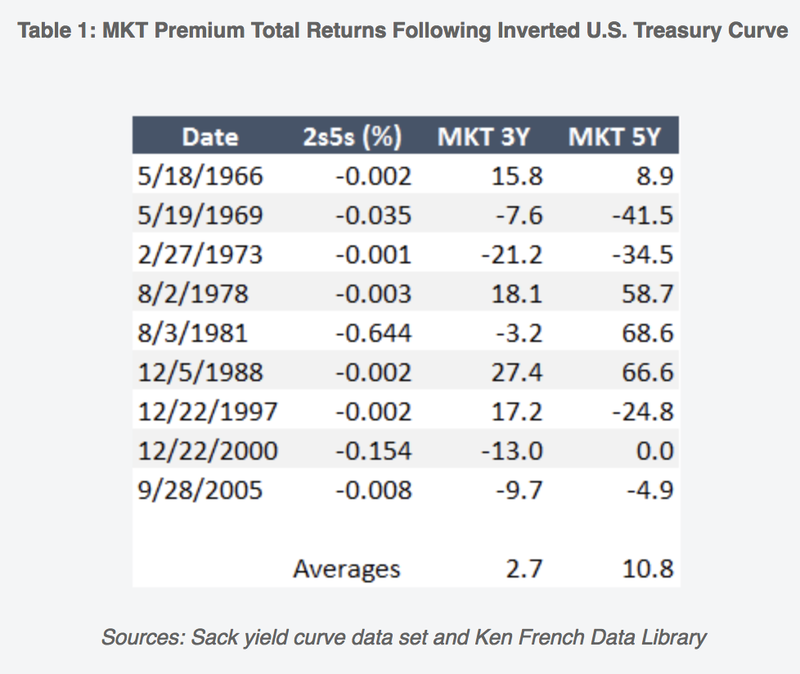 Hence, after accounting for any term premium, the steepness or inversion of the yield curve tells us something about relative expectations, no more or no less. 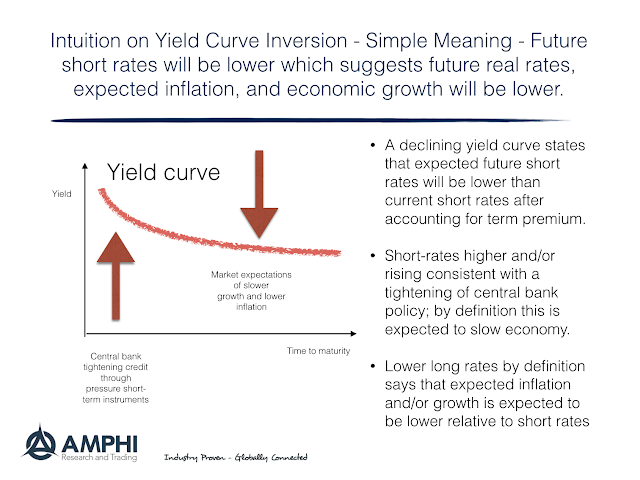 A greater yield slope slope translates to greater divergence between short and longer-term expectations. An investor just has to ask the simple question, "Do I agree with the relative expectations in the curve?" Given what the market is telling you, the next question is whether you should act on this view today. An inversion in this framework should be view dispassionately. 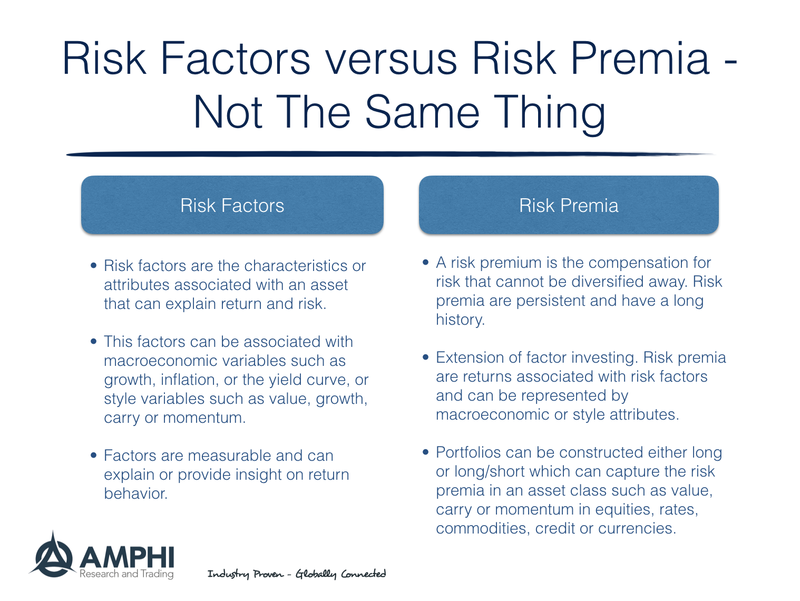 There is a difference between risk factors and risk premia. This may be viewed as a subtle distinction, but it is important to think about the differences. Factors explain the return attributes of an asset. Those attributes may be either style or macroeconomic factors. Factors provide a description of what drives returns. A risk premium is what an investor receives for taking-on the risk associated with a factor. A risk premium is compensation for non-diversified risk which can come in the form of a style or a macro factor. A factor is a measurement of a characteristic. A premium is compensation for holding a characteristic. Investors want to be paid a premium for a persistent repeatable factor. Time Varying Alternative Risk Premia - Do You Want To Be Active Or Passive? 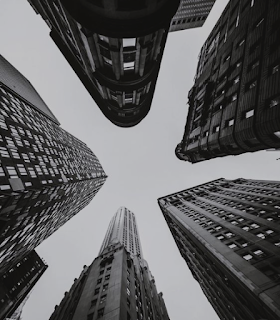 A big issue with building an alternative risk premia portfolio is whether you believe that it should be actively managed or whether it should just be a passive diversified portfolio. This is a variation of the old issue of whether there is investment skill with predicting returns. Investment skill is not just isolated to security selection but also can be applied to style rotation just like asset allocation decisions. Passive, however, may not mean there is no investment action. Passive portfolio management may include rebalancing and resetting allocations based on a criteria such as risk parity or equal risk contribution. This passive investment is based on the assumption that investors do not have skill at determining expected return, but there is value or skill in managing volatility and covariance. Active management would represent changing the choice of ARP styles or weights based on some set of predictive factors of return. The active question revolves around the issue of whether risk premia are time varying in a systematic fashion. To answer this question requires a classification of risk premia based on their characteristics and whether those characteristics are predictive. Risk premia have sometimes been classified in two forms: those associated with compensation associated with the aversion to a specific risk and those that are associated with investor behavior. In the case of risk aversion, the alternative risk premia will include value, carry, and volatility. Investors are paid to hold a specific risk that may be tied to the business cycle or market risk. 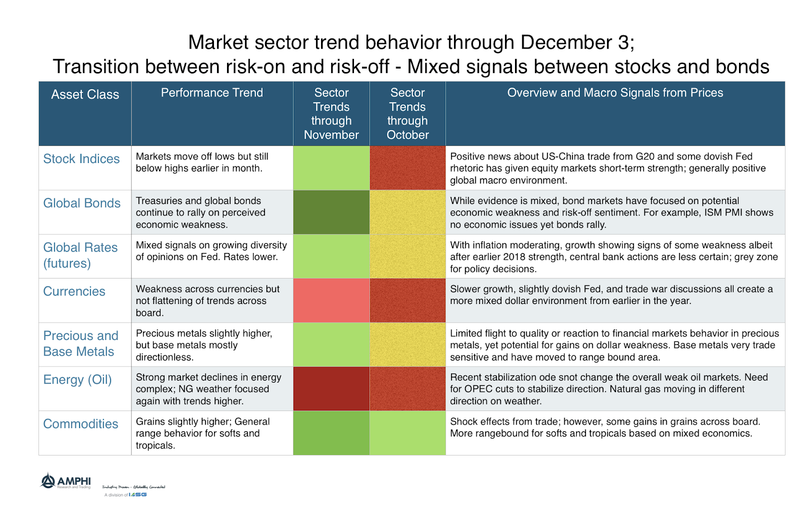 Those premia associated with behavior will include momentum or trend, and defensive styles. Investors are paid as compensation for what may be the "bad" behavior of investors. There are some premia that are structural and independent of any cyclical factors and others that are time varying and have a relationship with some cyclical factors. We would expect that premia that are driven by risk aversion will vary with changes in perceived risk that needs to be compensated. Premia associated with behavior will change with the environmental uncertainty that causes biases away from rationality. Overall, some premia styles should be more predictable than others. 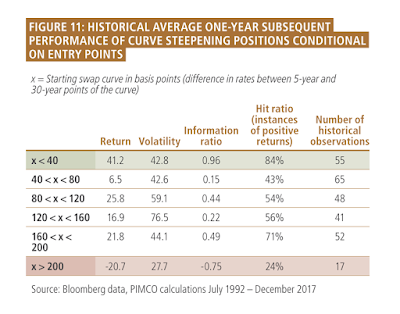 Some will argue that even if these factors vary over time, it is not possible to make active decisions on when to hold or exit these premia. These investors would argue for passive portfolios that are rebalanced by risk. Others will argue that there is enough information to make these allocation judgments. They would focus on rebalancing methodologies with the potential for risk premia tilts. 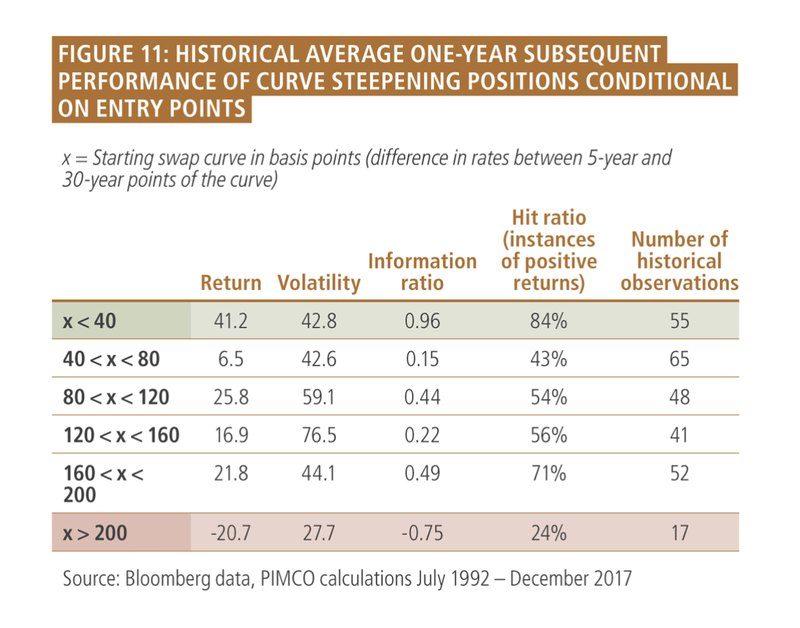 We believe that risk premia prediction is difficult and should be done carefully but there are periods when the odds for performance will be stacked against a specific risk premia style. Measuring and tracking this performance behavior should be rewarded. Everyone talks about bear markets; however, it is surprising that this downturn definition is so arbitrary. Commentators are somewhat cavalier with their discussion of bear markets. It is a down move of 20% from a high price point. A correction is a down move of 10%. 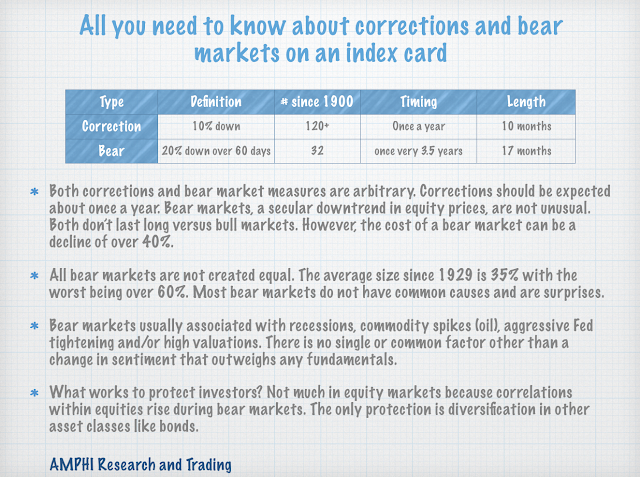 A bear definition could be applied to a individual asset, a sector, or an asset class. Bear markets do occur on a regular basis but there is little clarity on the cause. Bear markets have been associated with recessions, although stock markets usually decline before the dating of a recession. They have also been tied to central bank tightening shocks, but tightening is also tied to recessions. Bear markets are usually worse when there are high equity valuations. Commodity price shocks may generate a bear market and are also associated with recessions. There is a clear change in sentiment when the market perceives a bear environment; however, negative sentiment may just be the outgrowth of the market decline. 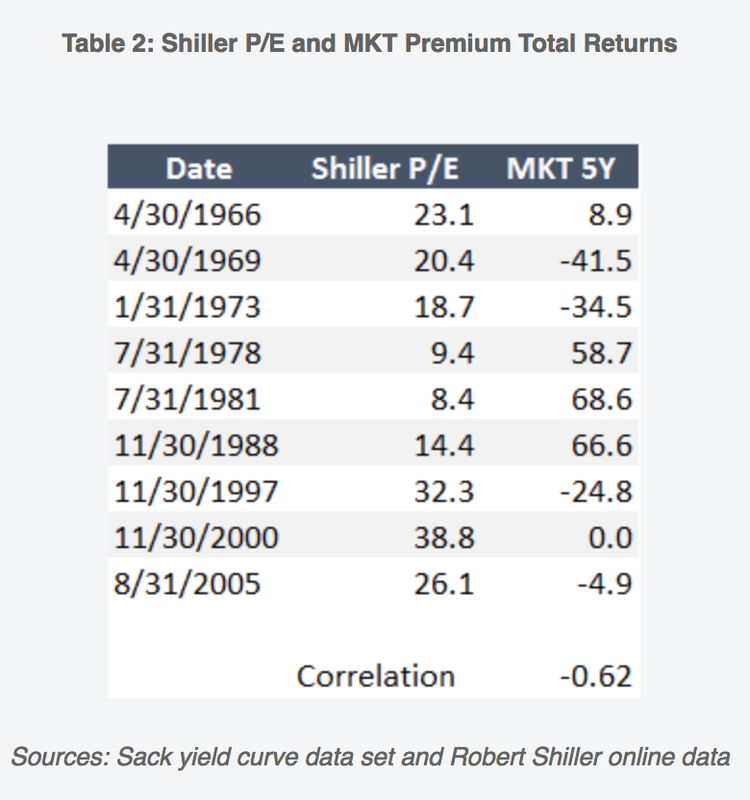 The only way to protect from a bear market is to ensure that you have a diversified portfolio with assets that are fundamentally uncorrelated with equity markets. Diversification across equities will only provide limited protection. Protection comes from holding unique asset classes or alternative investments that are not sensitive to the market risk factor. Let's just make things clear. There have not been many yield curve inversions, so analysts who want to study the behavior of asset prices during inversions have limited data. Yield curves may signal recessions which may also signal a decline in equities associated with slower growth, but the timing links are highly variable. The risk differs depending on how the question is asked. The relationship between the yield curve and equity prices is not easy to unravel. Yield curve inversion may signal tighter monetary policy that affects credit availability which leads to a decline in equity prices. The impact can be affected by whether rates are rising or falling. It is can be affected by the valuation in equities. The answer on return impact can be affected by whether you are looking at current or forward returns. There is no single answer and much of the work has not been rigorously tested; however, there is enough research to make some judgments. Flat and inverted curves can be good for curve steepening trades. Flat curve periods can still see positive equity returns. Equity returns during the period between inversion and recession have been positive. The average period between inversion and recession is 17 months. 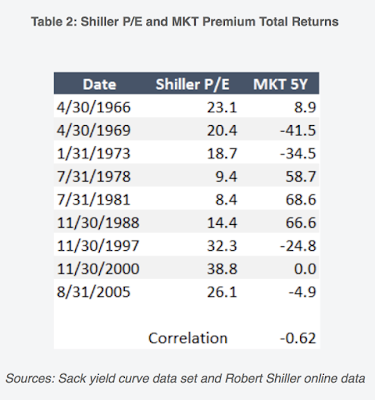 Valuation still is an important driver of future returns regardless of the yield curve. There is a long but variable lag between a yield curve inversion and the start of an equity correction. The PIMCO table suggests that fixed income investors don't have to worry. Flattening and inverted are good returns periods. Those steep curves are when you have to worry. This mixes cause and effect. Steep curves means we are likely in a recession and monetary policy is being used to help the economy. Flat and inverted curves mean that we are late in the business cycle. Better for fixed income. 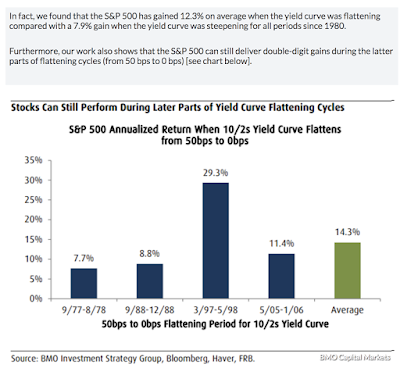 From BMO, equities can do well in a flat yield curve environment. From BlackRock, the worst equity returns are during a bull steepening period. 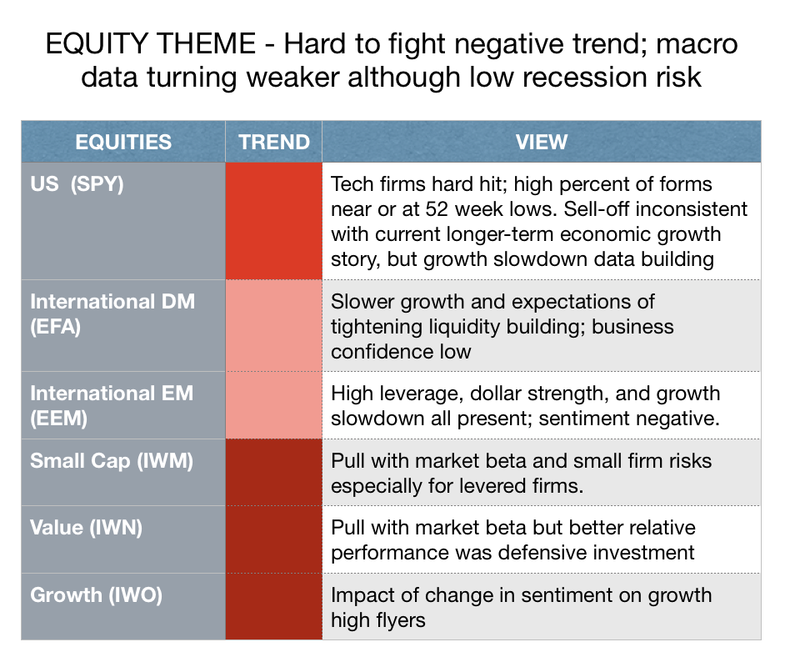 From LPL, the period between inversion and recession is associated with positive equity gains. From The BAM Alliance, looking through the inversion, investors will be rewarded with positive returns; however, the impact will be related to the valuation at the time of the inversion. From Ritholtz Wealth Management, returns are generally positive for the period between inversion and recession. There is a long lag between inversion and the start of the correction, but the lag period is highly variable. Central Bankers as a Tribe of Technocrats - Outside the Mainstream? 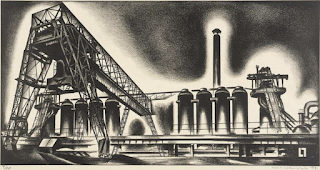 Are you a technocrats or a politician? If you listen to central banks, they will say they are just technocrats or experts who do not engage in politics. 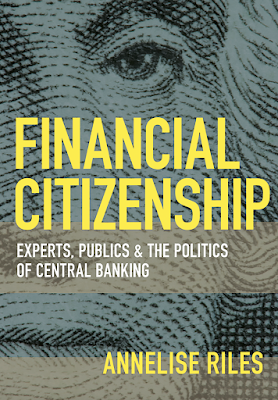 To discuss political implications of policy or have politicians involved in the discussion is an infringement on a central banker's cherished independence. Only through independence and limited oversight can central banks do their sacred technical work. More overt discussion of politics will impact central bank behavior. There will be a biases when pandering to voters. This may be a bias toward inflation for the debtor class, or dovish policies that favor full employment. 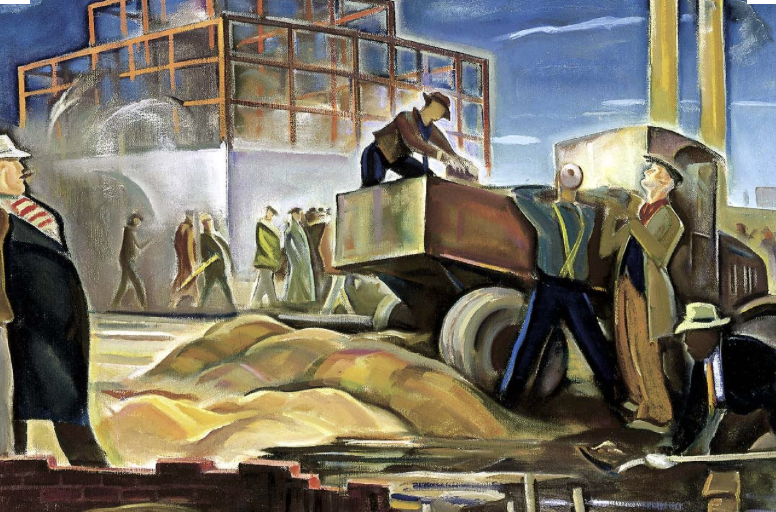 A central bank may have inflation and employment mandates, but central bankers, as a tribe, do not want outsiders overseeing or critically evaluating this process. Nevertheless, central banks are inherently political given their policies have strong distributional effects on the economy and citizens. There are choices to be made that will affect all citizens. 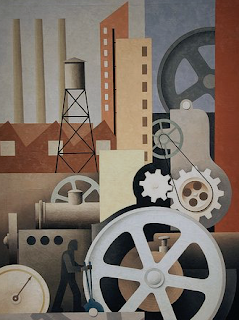 There are trade-offs that move beyond the simple idea that a technocrat is trying to fine-tune policy instruments to hit some economic target. 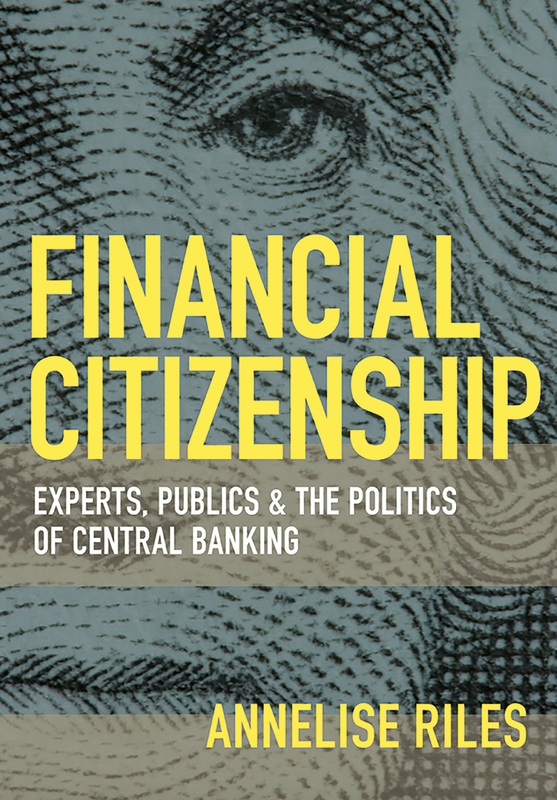 Annelise Riles, an anthropologist and legal scholar who has focused on ethnographic research, has written a provocative book by taking a different perspective on central bank behavior. She explains the central bankers through an anthropological lens. These central bank experts form a community with social relationships which are outside the norms of the rest of society. Central bankers have more in common with other central bankers and not the average citizens in the country where they work. Their success is gauged by their peers around the world and not by the average citizens they serve. Everyone leading player from the central bank tribe is likely to be a PhD economist and is steeped in the macroeconomic speak. They like their autonomy so they can focus on their community with little oversight by those outside their social network. As we end the year with one more Fed meeting and growing focus on the number of rate changes in 2019, we should at least be aware of the disconnect between the tribe of central bankers and the rest of the economy and financial community. 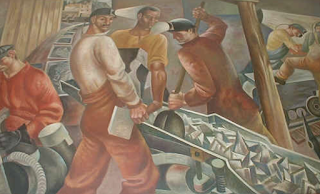 The focus of central bankers on quantitative tightening, normalization, forward guidance, rate mechanics, and bank regulation can be far afield from many who are interested in real wages and wealth accumulation for retirement. Monetary technocrats may be insensitive to the distributional effects of policy not only in their countries but around the globe. This is not a call for any specific policy but a greater awareness by central bankers of the indented and unintended impact of their actions. The cost of being wrong with political uncertainty is significant and the impact will be felt across many markets. 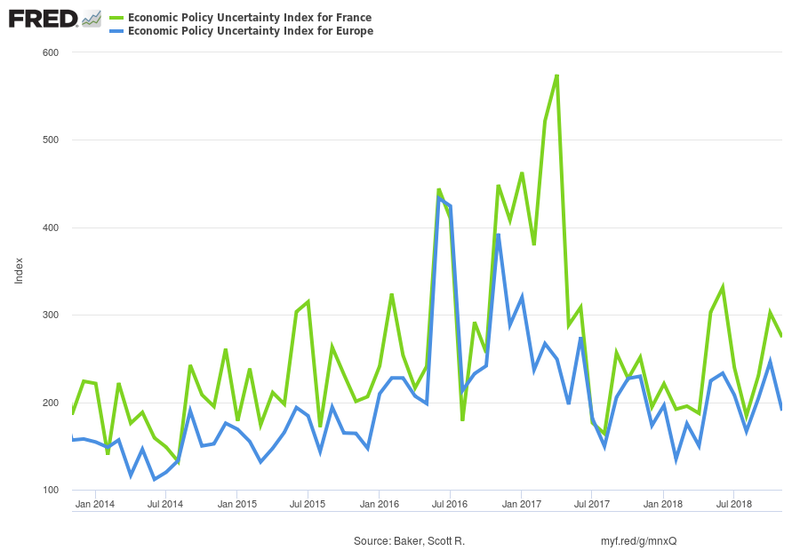 The yellow jacket "uprising" has already shifted French economic policy and will also affect the direction of government. We may not be extremists but the fundamental pact between the governed and government is broken which is not good for any investments. The five-year CDS spreads are not reflecting the upheaval in France. Bond spreads have widened but don't seem to reflect the seriousness of the politics. Stock indices do not show any abnormal returns. The economic policy uncertainty index does not reflect these risks although there needs to be a new update. There can be overreaction to rioting news, but the seriousness of these risks do not seem to be reflected in prices. Given close bond and stock substitutes in Europe, a conservative approach of avoiding France seems warranted. The trend environment has changed over the last month. Bonds continue a strong up trend around the globe although equity indices have moved off lows and have started to trip buy trend signals. This pattern of buy signals for both stocks and bonds is not what is usually expected. Rates markets are now suggesting that central banks may not be as tight with funds. Eurodollar futures are starting to move higher based on greater disagreement on Fed action. Currencies are still showing weakness although the global macro story of strong US growth, Fed tightening, and flight to quality seems to have weakened. Gold is moving higher although the precious complex is not moving in tandem. The weakness in base metals has also fallen and now shows more mixed signals. Energy prices are still trending lower although there is greater uncertainty on further trend continuation. Natural gas prices have moved higher. Grain markets are moving higher albeit these commodity market prices are generally still flat. Broader commodities show more mixed signals. Liquidity starts to decline quickly as we move closer to the holiday season and after the Fed meeting. The general pattern is that markets become more range-bound for the last two weeks of the year. This was a negative month for managed futures funds as measured by peer indices for a simple reason, range bound behavior in equities and a reversal in bonds. Equity indices have started to trend higher, but longer-term trend followers were not able to effectively exploit these moves in the second half of the month. Global bonds have trended higher for most of the month but smaller position sizes based on higher volatility limited gains. Oil prices offered strong gains, but the size of positions may not have large enough to make an overall impact on fund returns. Commodity trades are generally a small portion of total risk exposure for large funds. Managed futures funds are unlikely to see a significant change in performance for the year in the next month albeit there are some stronger potential trends. Last month nothing worked with all asset classes generating negative returns. October saw a shift in market sentiment toward risk-off behavior. Investors started to take loses and adjust to more defensive portfolios. Momentum was clearly negative early in November, but monthly returns are sending different signals with both US and global equities higher. Nevertheless, it is too early to make any statement that risk-taking is back on. Equity markets have come off lows but are not showing any trends. Credit ETFs declined sharply relative to Treasuries and long duration bonds gained on new fears of economic slowdown. Commodities declined on a sharp fall in energy prices. Our measures of risk appetite show we are in a period of transition and not a true risk-off environment. Economic fundamental data show some growth weakness after three strong quarters, but there is limited evidence for a bear market. Recession probabilities are still low. Risk-taking in EM has shown to be profitable. The market correction may have been overdone, but a more defensive focus is still warranted given the mixed environment. If you have an asset that has an illiquidity premium, an optimizer will love it as a choice. An illiquidity premium is a dangerous area for investing. First, are you getting paid enough for illiquid? Second, is there a good way to measure illiquidity? Third, do you really know your liquidity needs? 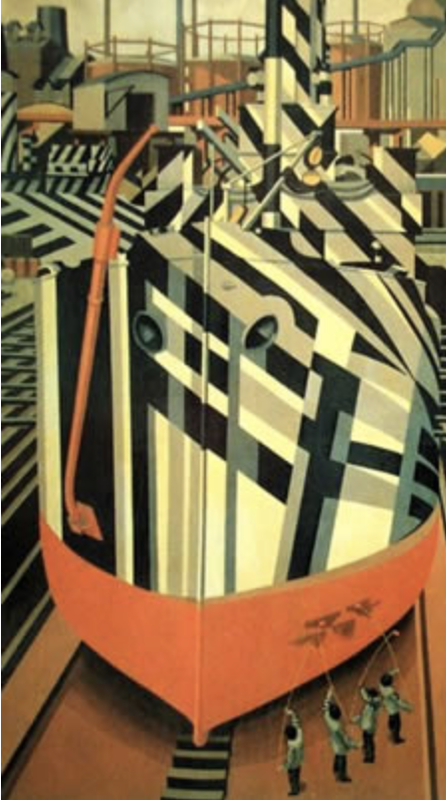 There are two assets, one liquid and the other illiquid, for consideration. The illiquid asset has a slightly higher yield, a premium for less liquidity. An optimizer will choose the illiquid investment, all else being equal. The illiquid asset will have a smoother volatility. The optimizer will again prefer it versus a liquid alternative. An illiquid investment will not react as quickly to new information and will be less correlated to other assets. The optimizer will again prefer it. An optimizer will love an illiquid asset, and that is a problem. Now, we have been extreme with our view of a two assets, but the point should be clear. There will be allocation distortions if you do not properly account for illiquidity. Liquidity will never be available when you want it. Illiquidity will never improve from what was sold to you. So how do you address the illiquidity problem? There are two simple solutions. First, rough-up the data by using a volatility that may be closer to the volatility of the asset class associated with the illiquid asset. This will downgrade the smoothness of the illiquid asset and will also increase the correlation with other assets in the asset class. Second, cut the returns that will represent the risk premia associated with liquidity. An optimizer does not think about liquidity. An investor should account for these factors. A big problem with macro fundamental investing is getting timely data on the economy and then translating that information to effective investment signals. Government issued data generally are out of date and old information for forward looking forecasts. Hence, there is greater value on macro data that is current and prospective. The PMI forecasts, which are announced monthly, are a good macro candidate given they are measured across a broad number of countries, have significant history, and are forward-looking expectations of economic activity. 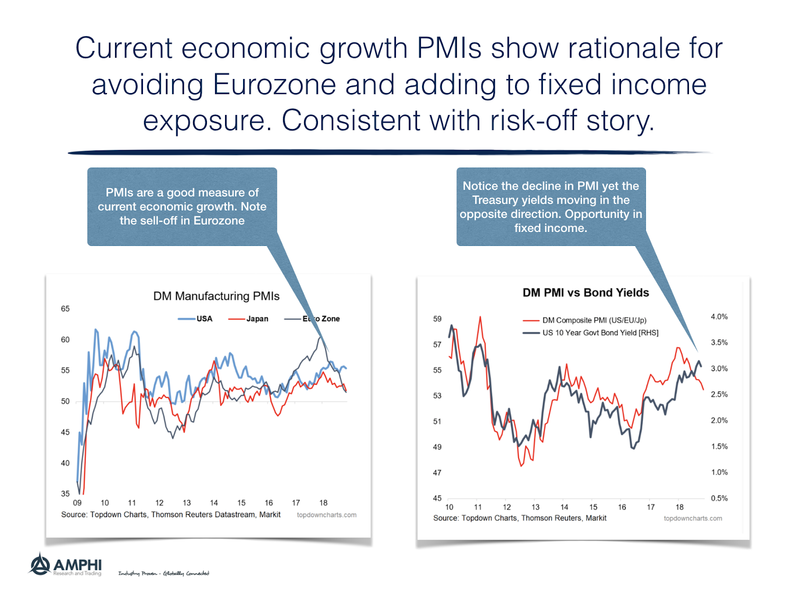 A graphically analysis of PMI explains the major sell-off in European equities relative to the US. It can also explain the decline in EM equity valuation. Similarly the PMI forecasts can tell us something about the broad trends in bonds. If the PMI is declining (increasing), there should be a bond rally (decline). Rates fall during declines economic activity. Investors just have to get an early signal. The current reading suggest that any switch away form equities should focus on bonds not cash. "Categorization is not a matter to be taken lightly. There is nothing more basic than categorization to our thought, perception, action, and speech. Every time we see something as a kind of thing... we are categorizing." Most investment work is about forming categories. We divide securities into asset classes. We make subcategories within an asset classes. We make industry classifications. We divide risks into different types of premia. There are value classifications. There are categories and classifications based on macro factors like inflation. Investors like to group. All scientists like to make groups and form clusters of similar things to find commonality. The basics of science have always been about categorization. Whether animals, plants, or rocks, the basic work of observation and classification has been a core principle of observational science. Before there is theory, there is observation and the observation lends itself to systems of classification. Before we can offer explanation, there is a need for categorization and search for sameness and differences. Providing taxonomies helps us understand the world around us. Categorization is part of the narrative of science and a normal part of the storytelling of finance. The categorization is a heuristic for finding or describing correlation and similarity. The theory of finance attempts to look beyond classifications or categorization and in order to find first principles of what is an asset separate from any naming convention. There can be a distinction between categorization and classification because most things do not fit into simple boxes. Classification is more formal and systematic based on rules. 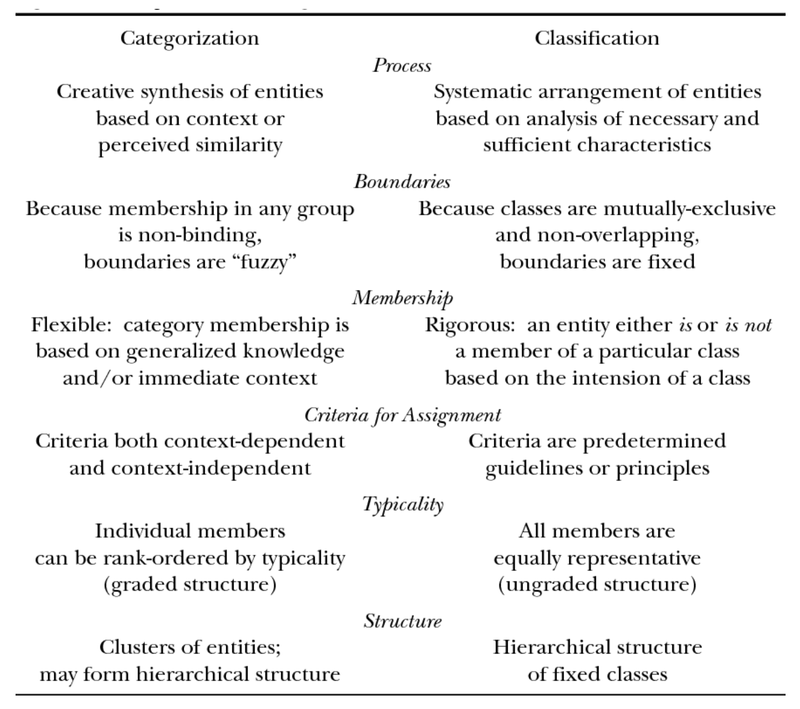 Categorization uses boundaries for similarities. See Elin K Jacob "Classification and Categorization: A Difference That Makes A Difference". 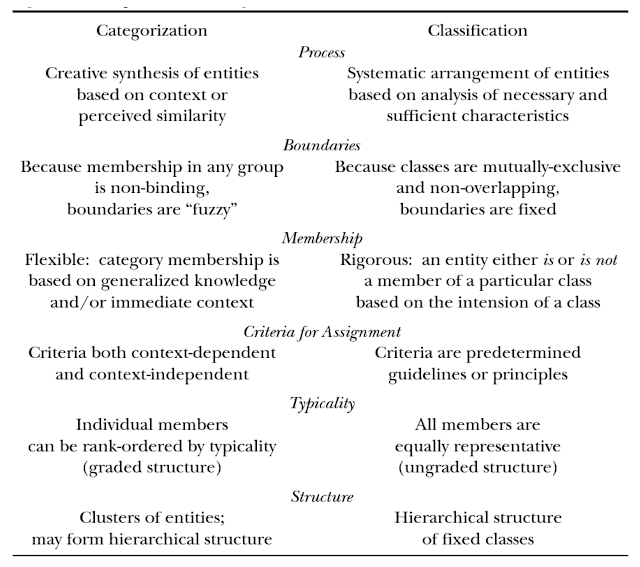 The structure of categories and classification are not often discussed and just assumed, yet the choices are important. 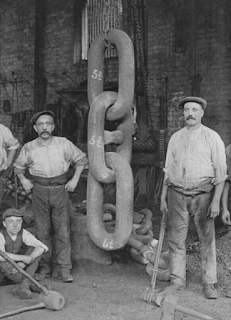 By grouping stuff, we can find commonality and outliers that may suggest opportunity. 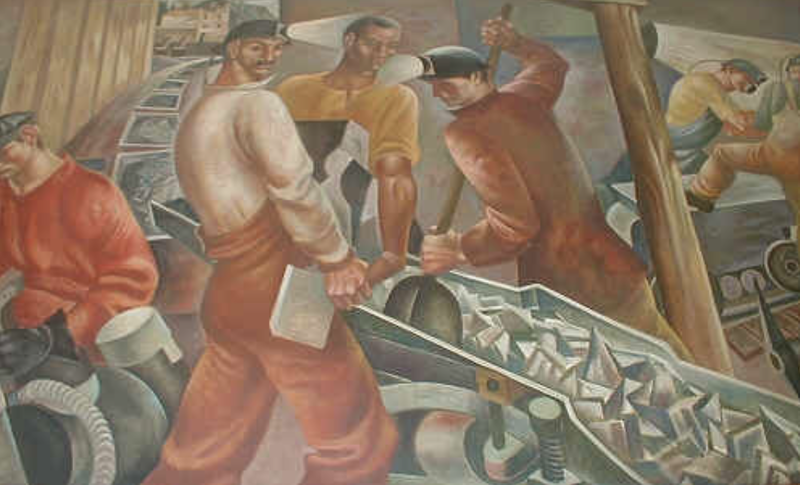 The convention of what is a stock or bond or the distinction of what is an industry matters. The classification of an asset, which at times is seemingly arbitrary, has structural implications. 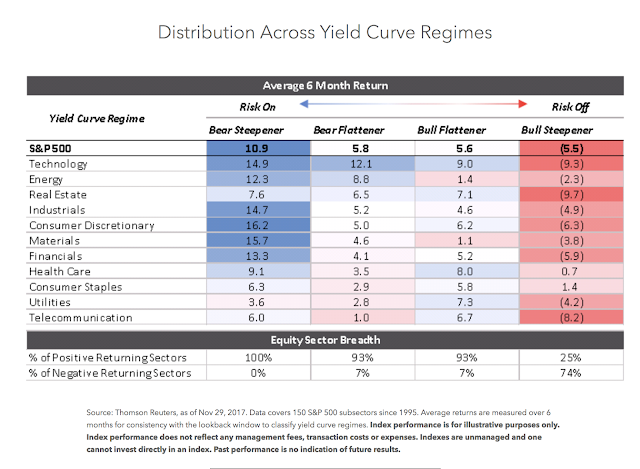 Whether rated investment grade or high yield or whether included in an index or excluded, the category placement will have real return impact. How a manager is classified by the Morningstar service, or even how a hedge fund identifies itself matters for relative performance. So when building a portfolio and discussing allocation decisions across asset class, managers or risk premia styles, think about the implication of your categorization. The breakdown of asset classes or subclasses will impact investment decisions and return. Growth - While recession risks are still limited by any probability-based model, economic growth will be tempered in 2019 both in the US and rest of world. Earnings have not yet been significantly affected by growth, but forward expectations are now slightly biased downward. Liquidity - Continued Fed tightening and expectations of tightening around the rest of the world serve as a negative for fixed income. High rates are starting to impact higher levered firms and lending. Make no mistake this is what central banks want. Risk Appetite - Higher volatility with changes in sentiment suggest market is moving to risk-off environment. Financial condition trends are pointed lower. With risk-off, harder to buy on dips so more downside follow-through. Structural - Gridlock in government will negatively affect further tax reform and regulatory changes. Fiscal deficit is now pro-cyclical which will further affect rates. Looking over year-to-date, six-month, and three-month returns shows three distinct differences: The divergence between US and rest of world, the dislocation between large-cap and value, growth, and small cap equities, and the reversal of the earlier international underperformance. Can you improve on the 60/40 stock/bond allocation without changing the 60/40 allocation? 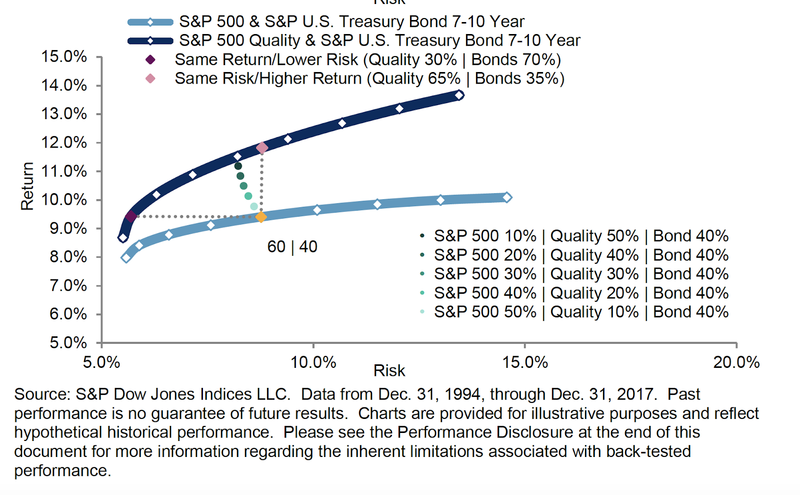 The classic 60/40 stock bond mix has proven to be a good core asset allocation. 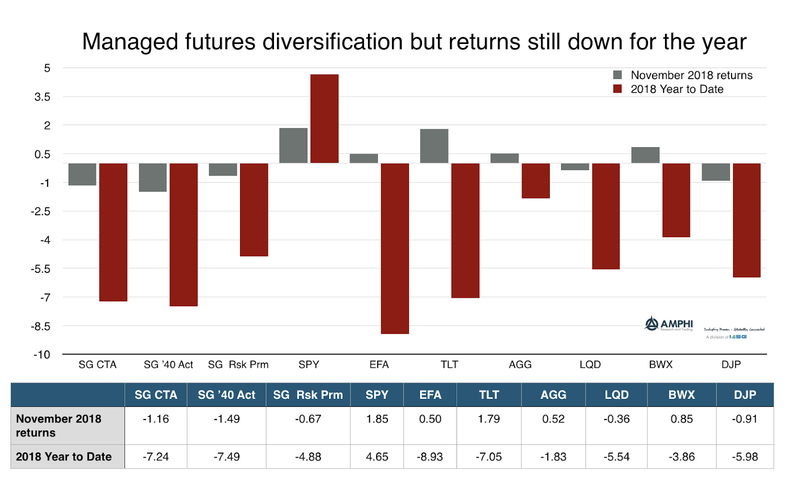 When in doubt, employing the simple 60/40 (SPY/AGG) asset mix as a base case has been an allocation that has performed well versus other diversification strategies. This allocation bias may be coming to an end. 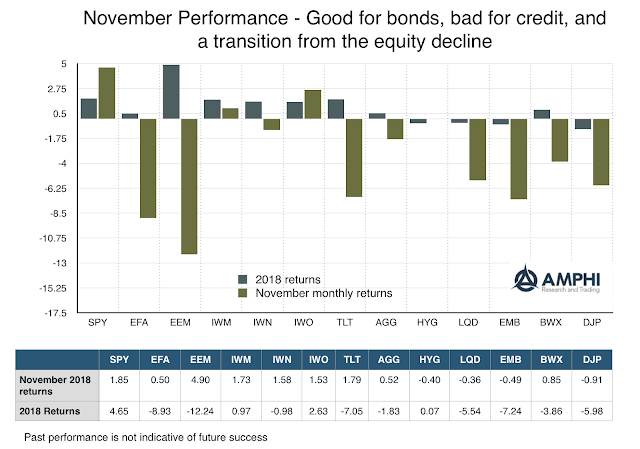 The gains from holding a US focused large cap equity and diversified bond allocation and not being further diversified across investment risk premia styles and international equity and bonds is a function of the recent performance and not special characteristics. Performance for both stocks and bonds is now off from the norms of the last decade. The correlation between stocks and bonds is moving higher. Volatility across equities and bonds is also trending higher. Something more defensive may be helpful. 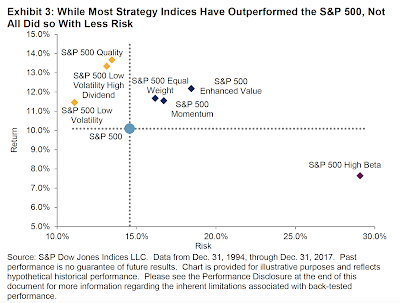 Smart beta strategies have performed well over a long period, but a better testimony of their current value will be with their ability to provide defensive benefit in a downturn. For those that want to maintain asset allocation and are not believers of active discretionary manager in any regime, the smart beta choices can offer some equity risk protection. First, the smart beta choices will change the mix of equity exposure, generally broadening the exposure away from large firms with momentum. Second, smart beta can focus on preferred characteristics like quality or low volatility that should provide defensive benefits. A tilt to long-only risk premia and away from market cap indices can preserve risk allocation while providing defensive characteristics. The same can be done with fixed income through reducing duration while maintaining credit exposure. A traditional 60/40 asset mix can be converted into a defensive 60/40 allocation. 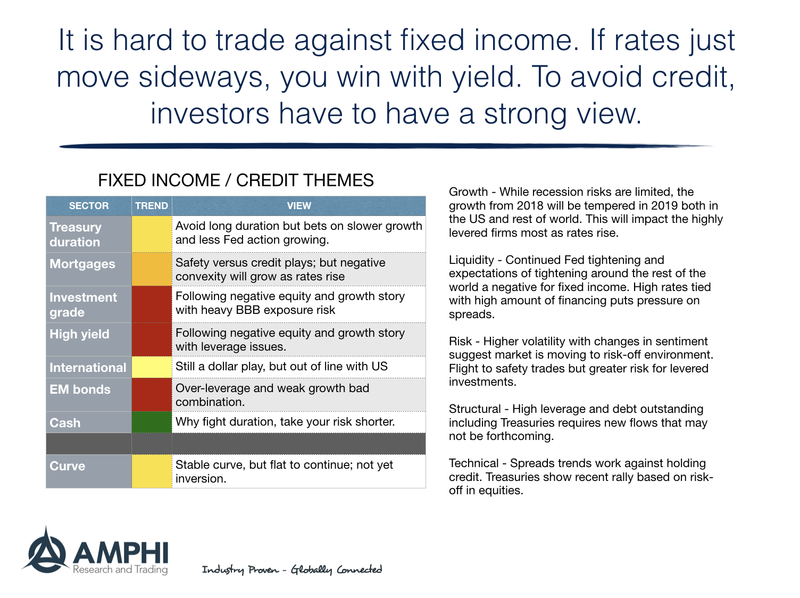 Current views on asset allocation in fixed income and credit are generally negative. The focus should be on holding shorter duration and cash investments. Credits spreads are widening because of both increased economic and financial risks. International bonds both DM and EM are facing dollar funding risks and slower growth. Long duration Treasury bonds show high risk even with recent rally. Underweight market allocation and risk weighing in fixed income and credit. It does not take much for an investor to have a losing credit trade on long duration bonds. The average duration on a long-term 10-year corporate is around 8 and current OAS spreads for triple-B corporates are 160 over Treasuries up from 120 earlier in the year. Half this move will take investors back to levels seen in 2016 and wipeout all of the spread compensation for a year. 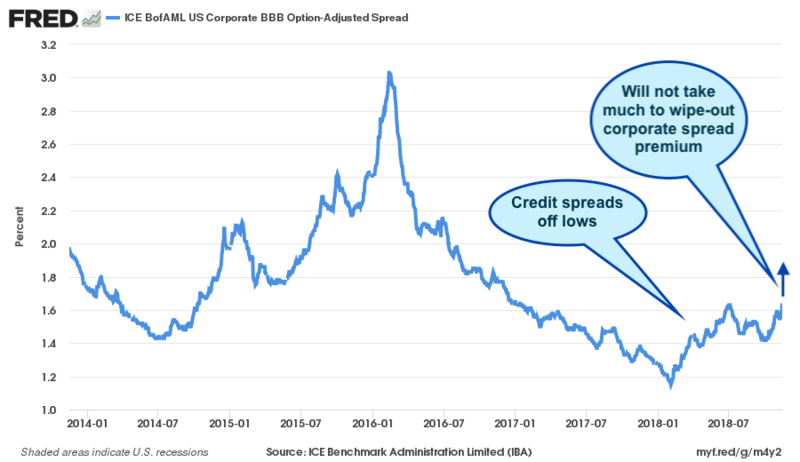 This is not an extreme bet if we have any further erosion of equity prices or change in credit risk expectations, (See Corporate debt growth has exploded - The added macro shock sensitivity creates real risks.) Shorter duration corporates will be at less risk given their lower duration but the stocking up of credit for yield reaching can be painful if credit risks increase. Even if investors hold the bonds for the longer-run, the marking to market will impact portfolio values. Holding less risk and moving to cash is a valid alternative, but this will place any investor at a severe disadvantage of reaching return targets. Portfolio protection is critical, so holding alternative defensive strategies need to be replenished. Any futures or derivative swap product may still allow investors to receive the risk free rate with excess returns associated with other risk premia beyond credit. The amount of excess returns from alternative risk premia can be dialed to a level of volatility that can match bond risk. Credit investing was an effective investment choice when rates were headed lower, spreads were higher, and the economy was improving. A new environment of late business cycle risks, falling equity values, Fed tightening, and spread widening requires different thinking. Diversification is usually thought of as a longer-term concept. Don’t worry if it seems like you are not receiving diversification in a given month or quarter. Think about diversification across a longer horizon. Diversification also does not guarantee better returns for a portfolio. Negative diversification does mean that your losers will be offset with winners. Yet, investors often look for diversification protection over short periods. If stocks are going down this month, they are looking for an offset this month. If stocks have had a bad quarter, investors are looking for something good this quarter. That is wishful thinking. Correlations change and the measure is about co-movement relative to mean values. 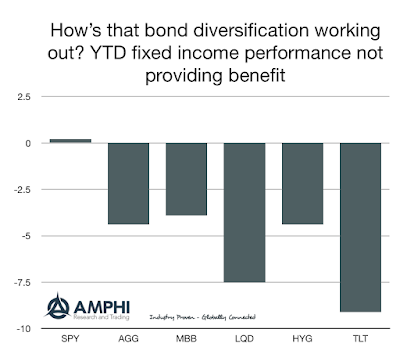 This year has not been good for diversifying assets like fixed income. Our simple chart shows returns for equities and some of the leading fixed income alternatives: the Barclay Aggregate, mortgages, long duration Treasuries, investment grade credit, and high yield. None have worked well at portfolio protection even though fixed income volatility with the exception of long duration Treasuries is less than half of equities. Investors are taking on a high degree of credit and rate risk during Fed tightening late in the business cycle. An alternative form of diversification is to breakout of asset class risk and switch to style risk that is focused on alternative risk premia. The concept of alternative risk premia is to isolate the risk within an asset class to some constituent components like value, carry, or momentum. This diversifies risk on another level beyond asset class or beta exposure. When blended across a number of premia, this diversification can be done with or without making a focused class decision.